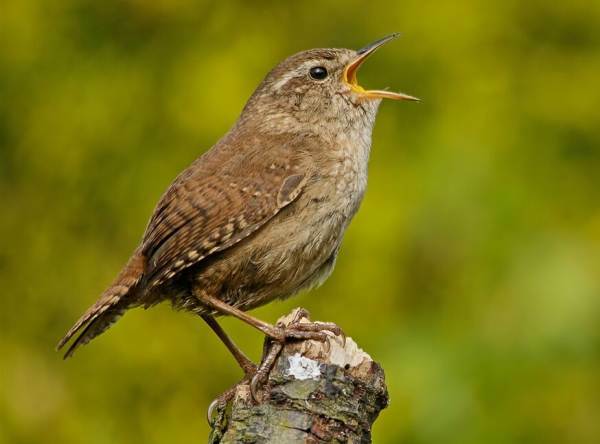 The Wren is a resident bird and found just about everywhere in Britain except the busiest of city centres; it is also a very common bird but good at hiding from view. Its upturned tail and small size are distinctive features, as also is its amazingly loud warble. The male and female are very similar in appearance. Wrens are communal birds, often nesting in groups of eight or ten together. They will make use of nest boxes, but more usually they nest on scrubby slopes or scree, and in cavities in trees, bridges and walls.